Dentures can normally be repaired the same day unless the fracture is very complicated. 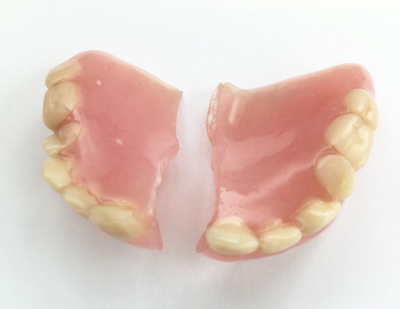 We can repair cracked or fractured dentures, insert strengtheners into dentures, repair chips in the artificial teeth and replace teeth that have fallen off. 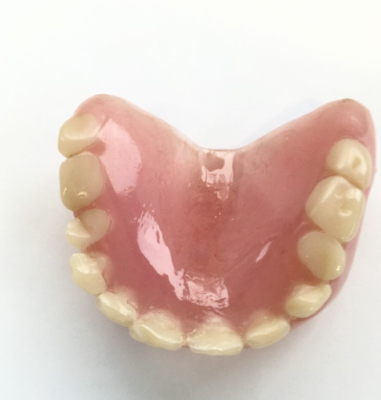 In some cases where there have been repeated repairs done to an existing denture, you may be advised to have a new denture made instead of having it repaired again. This is because dentures that have had teeth added or fractured multiple times may not fit as well as they should and are generally not as comfortable to wear. Keep all the broken pieces together. Don't use superglue or try and repair the denture yourself. This may offer a quick solution but rarely lasts long. It may end up resulting in further damage, make your denture impossible to repair again and make it uncomfortable to wear. Is is always advisable to have your denture repaired by a qualified dental technician who has the correct knowledge and equipment to do a good job. We endeavour to repair dentures on the same day. Please note this is dependant on dental laboratory availability and the time you drop the dentures off with us. We recommend you bring them to us as early as possible. Please note that it may be necessary to take an impression of your mouth prior to repair and that some dentures may require an adjustment when collecting.